The final six dates of Costello’s European tour, now canceled, included shows in Manchester, England; Pula, Croatia; Graz, Austria; Vienna, Austria; Tysnes, Norway; and Rattvik, Sweden. Still scheduled: a North American tour in November and December with the Imposters, supporting a new studio album that is due out in October (see those dates at Costello’s website). Below, read Costello’s full statement, and see reaction from peers and fans. 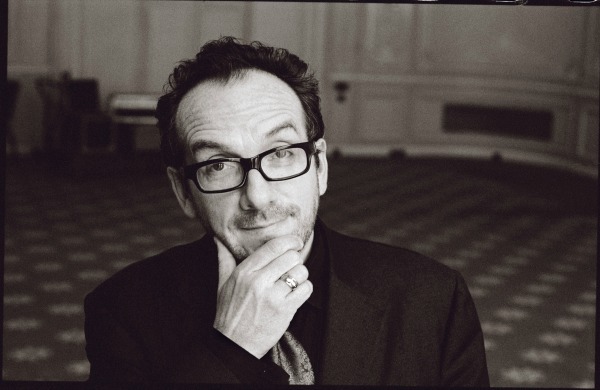 Anyone who has seen Elvis Costello play will know he puts a huge amount of energy into his live shows, so it’s understandable that he would cancel a few gigs to focus on recovering from cancer surgery. He’s one of my musical heroes and I wish him well. I once saw Elvis Costello play “Oliver’s Army” mid-set at the Royal Albert Hall, at the request of someone with terminal cancer. He’d normally save it for the encore, but he just said “Yes of course” and played it, no grumbles. Here’s hoping the universe shows him the same grace. I was at the CBS Records convention in London at which Elvis played outside to try to attract A&R attention. I’ve been a fan ever since. His live shows are amazing. Wishing you well you multi-talented man. Such a deluge of bad news of late. This is upsetting. So very sorry to hear about this. Aside from the fact that I have enjoyed Mr. Costello’s music for many years I saw him interviewed a while back and was very impressed by what a kind man he is. Best wishes for a speedy recovery. We are all pulling for Mr. Costello. He has provided so much joy to me and millions of others over the years. One of my first concerts as a teen where it was special since I felt it was MY music and generation he spoke to back in the late 70s when he was breaking in the US. Have followed ever since. All these years later, “This Year’s Model” remains one of my handful of most favorite albums. It got me through high school!